Typically, a spring cleaning means cleaning your home inside out, including that part of the house that gets unavoidably used – the floor. Whatever surface it is, be it tile, wood, marble, or vinyl, you will need to schedule a time to freshen it up. A good sweeping job is the first step you need to undertake. On a fully carpeted area, vacuuming will be easier if you move furniture out of the way. This will also help you position the nozzle easier for edge and corner work. Carpeted floors, after a good vacuuming, are usually cleaned with carpet cleaners. There are wet and dry types, with the wet cleaner being the more involved process. Dry carpet cleaner in Victoria is done by sprinkling a cleaning powder over the carpet and then removed (together with the dirt) by a strong vacuum machine. However, carpets that have suffered stains or water damage will need the wet method used on them. Like it implies, a wet cleaning agent is injected into the carpet and lifted out with a vacuum-like machine. If you go this route, it’s best to hire a professional who will ensure that your carpet isn’t left a mushy mess. With hardwood floors, sweep the floor to get the dirt out of the way and then use a mop. While a dusting agent will be the best treatment when using a mop, a damp mop will also work well to trap dirt. Don’t wet the mop too much as a very wet mop may leave the wood floor wet and take a long time to dry. At worst, you may even warp the wood in places. You can then use a cheap towel to remove excess moisture and help remove stubborn grime. You can insert the towel into a mop handle so the job is less murder on your back. If you’ll be using chemical agents to clean your hardwood floor, ensure that these are compatible with any finishes or treatments so that you don’t ruin the surface. For tiled floors, sweeping is again the first step. Since it’s not easy to stain a tile floor, a mild cleaner applied with a rag or mop will work. Sometimes water will do. Cleaning a tile or ceramic floor is very similar to cleaning a hardwood floor. Only the cleaning agents, if any are used, are different. Dry the floor with a rag or towel and it should be clean and looking fresh. Do inspect the grout to make sure that floor is still sealed. 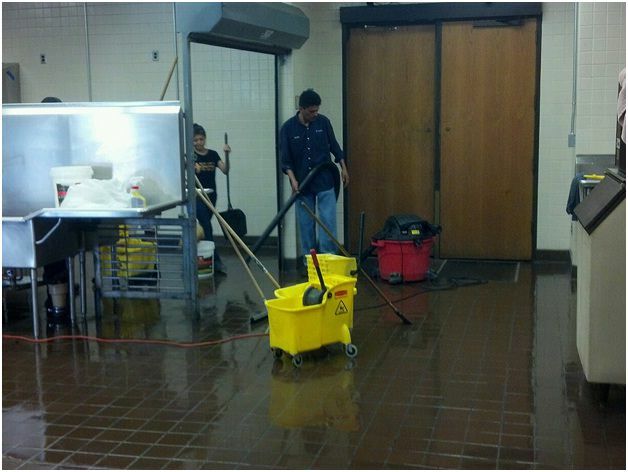 Vinyl floor cleaning is the same as cleaning a hardwood or tile floor. Sweep, mop and dry. For heavily soiled vinyl, a mild detergent mixed with water usually cleans up stubborn dirt. With the exception of carpeting, spring cleaning a floor is more about elbow grease. For stubborn stains and water damage though, it’s best to leave the job to professionals. Contact Sani Tech Services for more information on carpet cleaning.